Whizzers's Place: I like this idea and then onto the stars GREAT. I like this idea and then onto the stars GREAT. Wow I just hope I am around to see this happen. Anything space and I am like putty lol I like this idea I know it will happen naturally the thing is will it happen before I vanish to wherever we are destined to go I sincerely HOPE so. NASA’S bold plan will definitely succeed in the end one now wonders well I do if that famous slogan on star trek “BEAM ME UP SCOTTIE” will eventuate in the end much better I think to look for things like this and medical research than did a Siberian Sabre Toothed Tiger mate with a Diplodocus well you get my drift I guess. The future is what this world is all about not what happened aeons ago. Strangely my youngest son and I were only discussing these sorts of things recently re digging up the past etc and whilst doing so lived off of grants provided by governments etc. Now back to the important thing on my agenda a SPACE STATION ON THE MOON very important this especially if we wish to travel the stars which will happen I just know it. NASA has some very dedicated Astronauts they will one day make this an everyday occurrence. 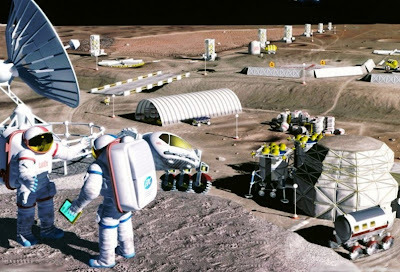 It seems NASA gave no details of how much the moon base would cost, it is however expected that the agency will fund its plans from its fixed budget of $16 Billion a year. A NASA spokesperson said that once the space shuttle was retired in 2010 NASA would also scale back its involvement in the International Space Station. Any savings would be directed towards the lunar programme. My thinking is there won’t be any savings indeed it will cost far much more than the estimated sum but so exciting even so other countries have been invited to join in with this. The UK is already involved in discussion with this far reaching project and other space faring nations will be asked. A great idea one that was actually promised by President Bush and maybe just maybe the world can settle down from its warlike activities I sure hope so. 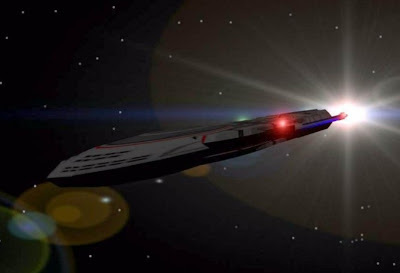 This is an artist’s impression of a future starship on the way to Mars and beyond, trust me it will happen one day just like the telephone and other things once mere science fiction. A couple of items one a tad personal. The boy King and more.